In scientific topics ranging from protein folding to the thermohaline ocean circulation, it is useful to model the effective macroscopic dynamics of complex systems as noise-driven motion in a potential landscape. In this paper we consider the estimation of such models from a collection of short non-equilibrium trajectories between two points in phase-space. We generalize a recently introduced spectral methodology for the estimation of diffusion processes from timeseries, so that it can be used for non-equilibrium data. This methodology makes use of the spectral properties (leading eigenvalue–eigenfunction pairs) of the Fokker–Planck operator associated with the diffusion process. It is well suited to infer stochastic differential equations that give effective, coarse-grained descriptions of multiscale systems. The generalization to the non-equilibrium situation is illustrated with numerical examples in which potentials and diffusion coefficients are estimated from ensembles of short trajectories. Crommelin, D.T. (2012). 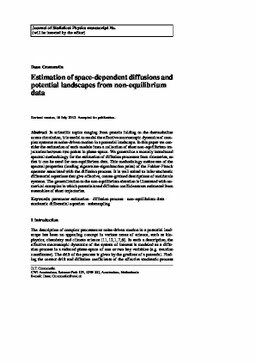 Estimation of Space-Dependent Diffusions and Potential Landscapes from Non-equilibrium Data. Journal of Statistical Physics, 149(2), 220–233.